Highlighting a first quarter in which both teams struggled to piece together an offensive drive, two big plays from the Tar Heels gave them an early edge on the Panthers. On the opening kickoff, the Tar Heels returned the ball 98 yards for a touchdown to take control of the game with a 7-0 lead. Responding with a kickoff return into Tar Heels territory, the Panther offense stalled and redshirt first-year kicker Alex Kessman drilled a 42-yard field goal to put the Panthers on the board, 7-3. After both teams traded punts, the Tar Heels found success through another big play. Sophomore quarterback Nathan Elliott found sophomore receiver Anthony Ratliff-Williams for a 40-yard one-handed catch to put the Tar Heels in the red zone. Two plays later, Elliott threw an 11-yard touchdown pass to extend the Tar Heels lead to 11 at 14-3. “I kind of tipped it back to him and he made a great play,” Whitehead said. Despite trailing by double digits at 14-3 to end the quarter, the Panthers worked their way back into the game during the second quarter. Opening the second quarter with a big play, redshirt sophomore quarterback Ben DiNucci found Hall streaking down the left sideline for a 30-yard completion. Hall finished off the drive on the next play with a 7-yard touchdown run to cut into the Tar Heels lead, 14-10. After a Tar Heels punt, the Panthers running attack found its footing. Capping off a 38-yard drive consisting of all running plays, Hall punched in a 1-yard touchdown run to put the Panthers up 17-14. Piecing together their first extended drive of the game, the Tar Heels responded with a drive into Panthers territory. Scoring off a trick play, Ratliff-Williams threw a 35-yard touchdown to junior receiver Josh Cabrera for the Tar Heels to retake the lead at 21-17. The Panthers found more success on the ground in their next drive and moved the ball deep into the red zone. On the goal line, junior wide receiver Quadree Henderson fumbled the ball and the Tar Heels returned the ball to the Panthers 34-yard line. The Panthers defense forced the Tar Heels to settle for a 51-yard field goal, putting North Carolina up 24-17 with 37 seconds left in the half. Unable to make any progress in so little time, the Panthers offense walked off the field down 24-17 as time expired in the first half. In spite of three momentum-swinging plays from the Tar Heels, the Panthers managed to outgain the Tar Heels offense on the back of a strong running game in the first half. Sticking with their ground attack, the Panthers opened the second half with a nine-play, 75-yard touchdown drive. Rushing for his third touchdown of the game, Hall tied the game at 24 apiece. Answering with their own extended drive, the Tar Heels offense came right back down the field. 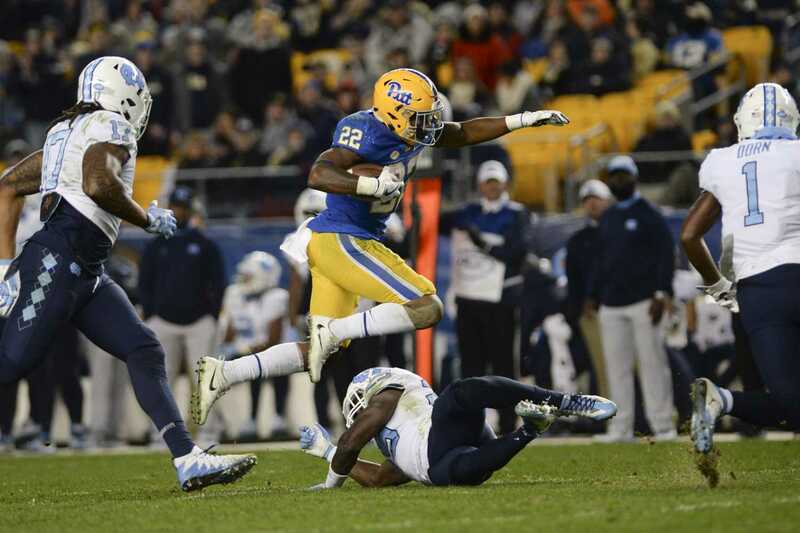 Pitt’s defense forced the Tar Heels to settle for a 48-yard field goal to give them a 27-24 lead. Pitt opened the fourth quarter with the ball, allowing Hall and the Panthers’ running game to continue dominating the Tar Heels defense. Rushing the ball on eight of the nine plays in their next drive, the Panthers drove 75 yards. Hall punched in his fourth touchdown of the night on a 1-yard touchdown run to put the Panthers up 31-27. The Tar Heels missed a field goal on their next drive, but after forcing a quick Panthers punt worked their way into the red zone. Elliot finished off the drive with a 3-yard touchdown pass to put the Tar Heels up 34-31 with a little more than six minutes remaining in the game. After a few first downs to start the Panthers’ next drive, the Tar Heels defense forced the Panthers to punt the ball away with 2:54 remaining in the quarter. The Panthers defense couldn’t stop the Tar Heels’ ground attack and eventually the Tar Heels ran out the clock to seal their 34-31 victory. Heading into their final two games of the regular season, the Panthers take on No. 17 Virginia Tech Saturday, Nov. 18, in Blacksburg, Virginia, as they look to win their final two games to become bowl eligible.